Reproduction hosing. Black rubber tubing with yellow flecked black braided sleeve. Correct 5' length. Fitted with an original twine bound Mk.IIIB* 6d/101 brass bayonet connector. This has well defined Air MInistry markings and 1938 date code. 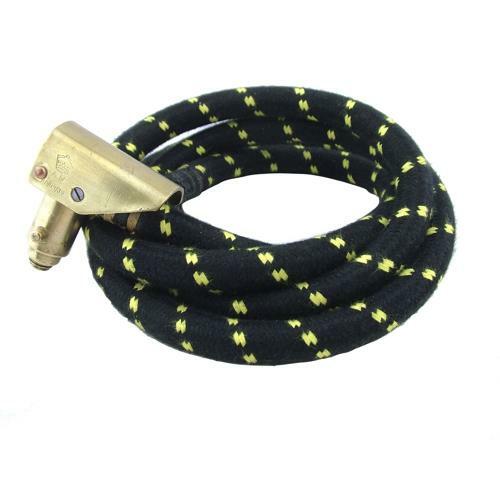 The hose is in excellent condition, completely flexible and undamaged. Original hoses are virtually unobtainable so this is probably the only way to add a hose to your collection. MK.IIIB connectors have recently been selling for very high figures on eBay. Stock code O23263.